A firm Zambezi favourite! 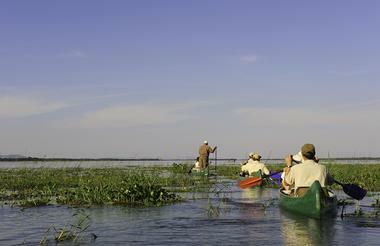 Our Fisheagle Canoe safari starts at Kariba and follows the river down to Mana Pools. Paddling through the Kariba Gorge with its imposing towering cliffs to the floodplains rich with wildlife. This has the be the ultimate way to get back to nature in Africa, so come and join us and see for yourself. We’re at the top of our game when it comes to canoe safaris. With over 21 years behind us our experience talks volumes! Our Fisheagle canoeing adventure is a leisurely affair. We set up camp before sunset on the river shore and only use top experienced canoe guides throughout the trip. Fisheagle Canoe Safari is semi-participatory so, everyone helps set up the camp each evening. We use two man dome tents which are simple to erect. All the food and equipment is transported by canoe so there are no back up vehicles. And, you don’t have to be an experienced paddler just so long as you’re fit and healthy. Finally, follow this link to read more about canoeing in Africa and other canoe safaris and more info about other Upper Zambezi Canoeing options on our sister website. Paddle along the Zambezi River from Kariba to Mana Pools by Canadian Canoe. 130 km of awesome canoeing from start to finish, covering around 21.5 km every day. In fact you'll find that the river current does quite a lot of the work for you so you won't miss out on the magnificent wildlife and landscape. To view wildlife drinking at the river from a canoe has to be one of the best vantage points! Our authentic camps have basic amenities but who wants 5* luxury when you have the scent of the wood smoke as it curls through the night air. So come and join our Fisheagle canoe safari - one of our most popular waterborne adventures! Safety briefing/check-in before heading to the start point. Paddle until lunchtime and siesta during the heat of the day. Carry on canoeing until 5pm when you reach the island, set up camp and relax! 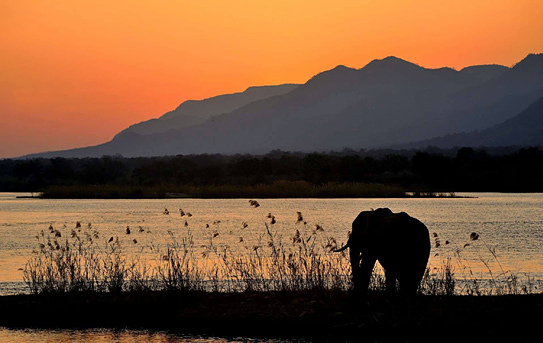 Tea and biscuits at sunrise, then onto the river, paddle until breakfast through the incredible Zambezi valley. Lunch stop, paddle on to Twin Logs island, home for the night. look out for elephant, impala, buffalo, crocodile and some amazing birdlife. Wild dog and lion are in the area but may be a little more illusive. Coffee at sunrise then it's all aboard the canoes to paddle to Lone Acacia Island, stopping for breakfast, lunch and siesta en route. Canoe until early evening and set up camp. Today canoe to Trichelia Island on the Zambezi River. Stop at midday for a well-earned lunch and siesta, until mid afternoon, paddle until 5pm, set up camp and watch the sun go down. An early start to arrive at Mana Pools at 10am. Canoes are loaded on to the vehicles, returning to Kariba by 3pm. all meals, basic drinks (water, tea, coffee & imported wine with dinner). The maximum luggage limit per client to take on the river is 10 kgs. A luggage room and safe facilities are provided for any extra luggage at the Kariba office. The minimum lower age limit is 14. Please keep luggage to a maximum of 10kgs per person. Bags should be soft duffel type not a suitcase. Our Fisheagle Canoe adventure starts and ends in Kariba.